The people who know me know I’m in Second Life for the creativity here…the effervescent, irrepressible joy of creation that flows through the grid like an electrical charge. Most of that creativity is cheerfully naive, including my own sad attempts, but every once in a long while you find someone who has found their medium in Second Life, and you rejoice. I hadn’t really been aware of the new accessories line *Essential Soul* Studio has come out with until now. I knew, of course, of their pose work, but the Metropolis sunglasses were new and enchanted me immediately. 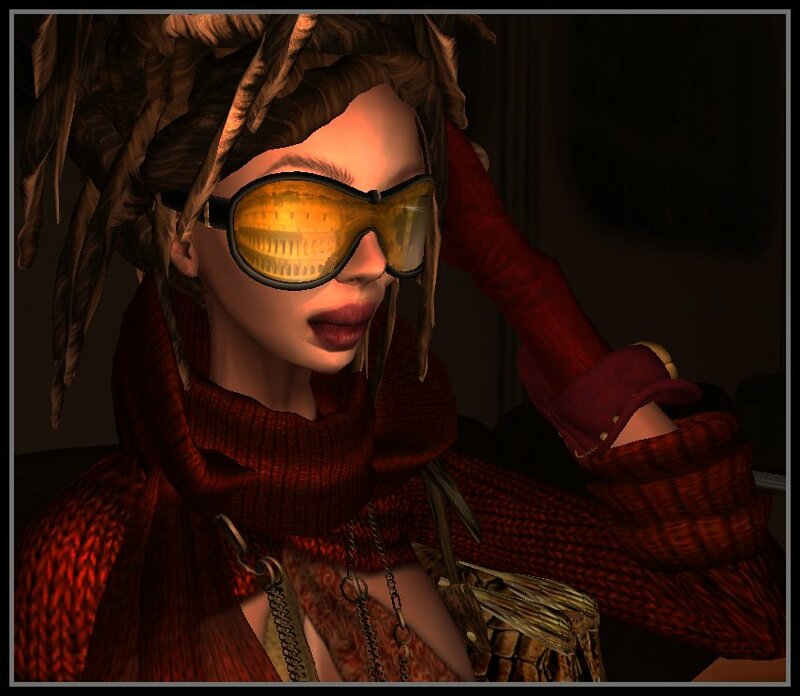 Well, for one thing–they’re gold, and I am a complete and utter fool for well done Second Life gold, which is every bit as rare in sl as the real stuff is in first. And this is well done gold, even allowing you the option of several glow settings (including none at all), so you can actually make it luminesce like real gold if you want. I *adore* that. Without luminescence, sl gold is just plain yellow. But the really sweet thing about these *ES* Studio sunglasses is they have images of various world-famous skylines you can put on the lenses–Rome, Paris, London, Moscow, Seattle, Cuba, Egypt, and amusingly, a nuclear bomb blast–as well as a plain gold lens, so you can really work the cosmopolite angle to its fullest. I chose Rome for the glasses I’m wearing here–the Colosseum, no less. So chic! The hair here is Boon, a line that’s a bit of a sleeper, but with the knack for out-of-the-box styles that don’t stray into fantasy and a really solid sense of color–something that you don’t get in most hair, where lurid seems to be the rule. The shrug and scarf are from the perennial Ibizarre Jumpsuit…many times blogged, the top is part of *Haven Design* Chained Heart outfit, and the pants are, of course, LeLutka. The boots are one of Cutea Benelli’s newer offerings, the edgy Grim Bros Cartography Ankle Boot. Take a closer look at these puppies! Where else can you get this charming design so skillfully done, these stunning textures–this positive wittiness!–and at such a great price too! A little lamp on the toe lighting your way? A brass telescope for a heel? Oh, Grim Bros. shoes and boots are the best kept secret on the grid. My final salute goes to the Baiastice_2009_ Golden Crocodile bag, which is so skillfully done as to take your breath away, like a kick in the head from behind. Now don’t argue with me—-just go look at it inworld, and you’ll see…this ain’t Photoshopping! This the real deal! This entry was posted on December 16, 2009 by aebleskiverthibedeau. It was filed under Fashion and was tagged with Baiastice, Bliensen+MaiTai, Boon, Curio, Essential Soul Studio, Fashion, Grim Bros, Haven Design, Ibizarre, LeLutka, Shade Throne.